options, how many zaplesti kosichki. In this article, we consider a number of ways, the most common. but before, than learning how to weave complex types of braids, You need to master the usual classical weaving. After all, the original comes from simple things. Usual plait braided easily. Smoothly combed hair is divided into three equal strands and begin to braid. The right and left of the hair crisscross alternately with the central strand. During weaving simultaneously monitor, to spit was smooth and taut. Basically, nothing complicated. This hairstyle can be done in two ways. It can be done without any help. Separating lock one side and begin to plait. 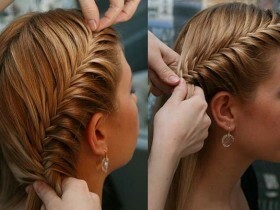 Braid is woven usual, only add, gradually grasping thin strands of hair from the left side. It is not necessary to tighten, Spit should be free, in limbo. Braid should be three such pigtails. To do this, collect most of the hair in a ponytail and fasten its rubber band. We begin to weave the first pigtail forehead, grasping thin strands. First pigtail ready. Weave another. Take from the tail hair and half, stepping back a little space from the first spit, in the same manner we are making the second, attaching thin strands. Of the remaining hair plait third pigtail. That's all. dragon ready. At the bottom of all three braids can twist with each other and to fix anything. On his head look great braids, covering each other waves. And further. Braids trailing side, but not in the middle of the head. Braiding French braid is on the same principle, as the dragon. With only one difference, it tight. Lead braid starting from the forehead, weaving into each side lock of the main additional plaits, which is taken from the pre left hair in the temple. Weave necessarily tight, to spit not crumbled with time. Owners of fine hair can braid pigtails in French anyway. In the middle of making a thin braid, also woven into it locks, loosely. Get free French braid in the form of mesh. This hairstyle is more suitable for young girls. Lagging several thin braids tight in the center of the head. Often limited to five braids. We must begin with the separation of the strands. A broad selection of the section of hair still on 15 identical pryadok. We begin to spin out of three extreme. Be sure to tighten tight braids. netting principle is similar to the French method, only much thinner strands. The central part of braided, You can also naplesti and side pigtails. But this is optional, optional. Finally I would like to touch the African plaits. They are now very fashionable. Besides, if properly braid, It looks very nice. Hairstyle consists of more than two hundred flat, Tugi skew. This is a very time-consuming and complicated work. Braid pigtails on Africa not everyone can, better to turn to professional. here, and all. We hope, this article will help to create an original image using the braids are not only themselves, but their kiddies, namely girls. How to create a hairstyle spike?